Another week of research at Oxford has yielded photos of, in round numbers, 3300 more examples of marginalia on 1500 more pages in 31 more individual volumes. Work this time around was greatly abetted by the ongoing work of Hazel Tubman, Somerville’s Delmas Foundation-funded research assistant. 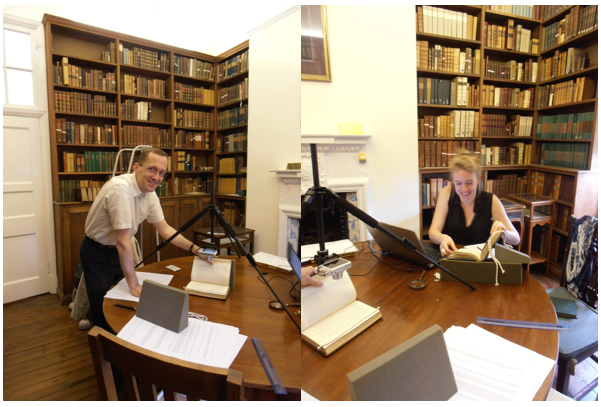 Hazel has begun the first serious effort to identify, collate, and enter into metadata spreadsheets suitable for use with the under-development Mill Marginalia database every single example of marginalia in the John Stuart Mill Collection. We’re all hopeful that Hazel will see her way to writing about her experience in one or more future postings on this site. 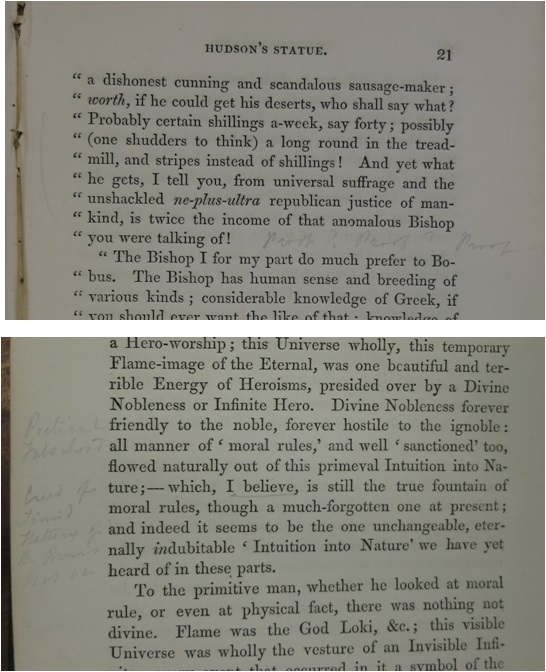 In the meantime, the marginalia from Mill’s copy of the 14-volume Works of Francis Bacon, to cite a singular example, looks promising on at least three fronts. First, it reveals Mill annotating in a new way. Rather than reading as a friend anxious to safeguard the reputation of someone whom he knew personally, as he does in Thomas Carlyle’s Life of John Sterling (about which more in a future post); or reading as a critic quick to point out, if only to himself, the argumentative shortcomings of another writer, as he does in Ralph Waldo Emerson’s Essays (for which see Frank Prochaska’s 2014 article in History Today); Mill evidently turned to Bacon’s Works as a researcher eager to find passages suitable for his own future reference. The result was hundreds of marginal scores, double scores, “NB”s, and “HS”s (presumably shorthand for “Holy Scripture,” since it appears beside biblical references). Mill occupies the margins of Bacon’s Works both literally and figurative, noting his predecessor’s experience and opinions without evaluating them as he does in other, more recent authors’ works. Second, these brief but numerous marks and annotations begin to appear with startling frequency in the tenth volume, which contains a portion of Bacon’s Life and Letters focused in particular on the inner workings of England’s government. 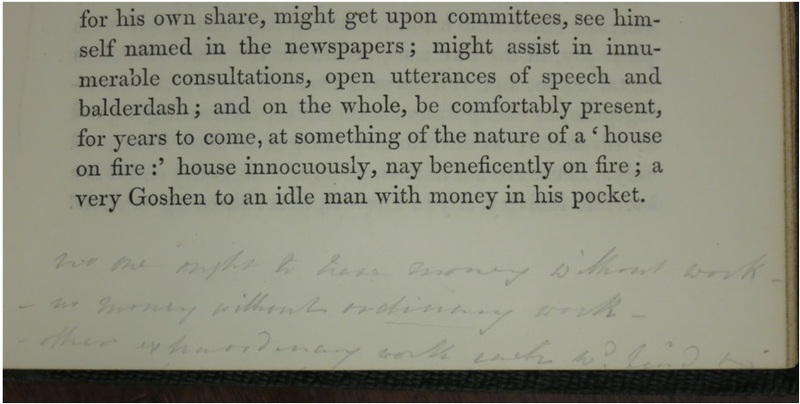 This volume was published in 1868, also the final year of Mill’s service in Parliament, and the coincidence of subject matter and date suggests that Mill may have been seeking passages to use in his own late parliamentary speeches. A search for marked and annotated passages from Bacon in the facsimile online edition of Mill’s Collected Works may yield some surprising and previously unknown connections in the future. 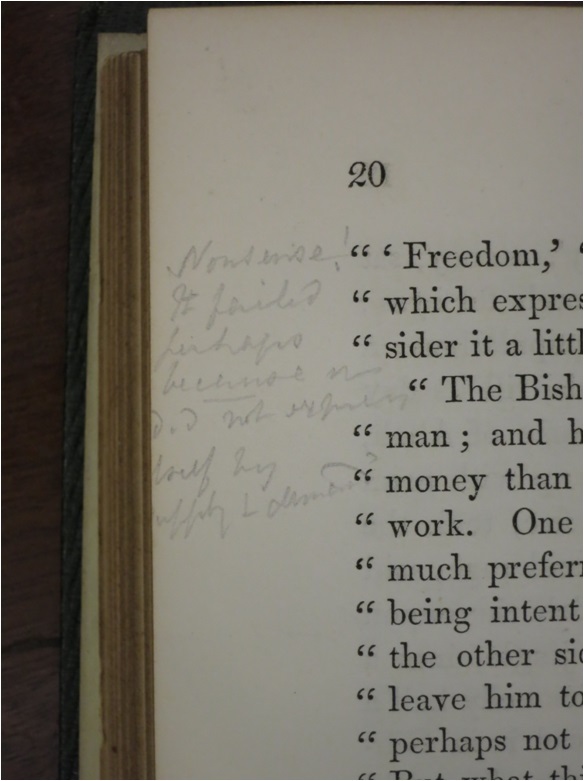 Third, Mill’s marginalia in Bacon’s Works suggests the need for, at the least, revision to and expansion of the listing for Bacon in the Bibliographic Index of Persons and Works Cited of Mill’s Collected Works. 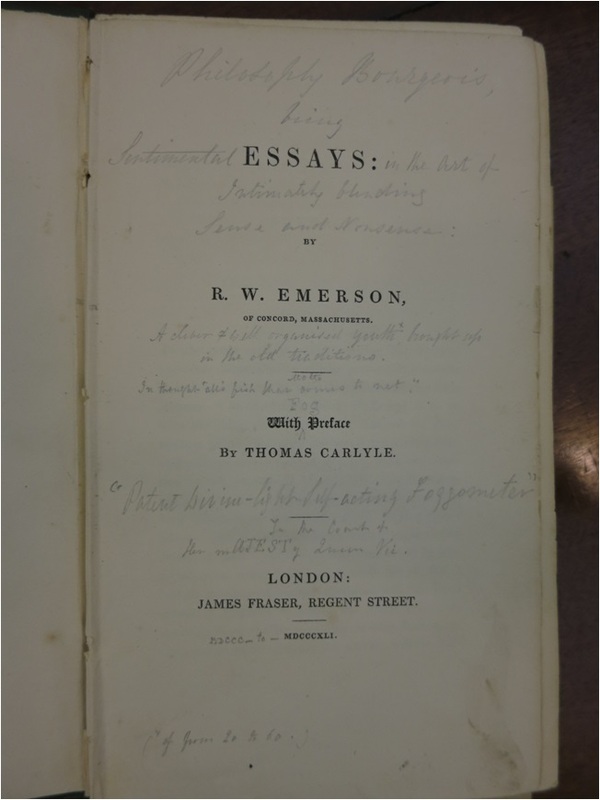 In Volume XI: Essays on Philosophy and the Classics, for instance, the editors acknowledge the presence of Bacon’s Works in Somerville’s John Stuart Mill Collection, but go on to assert that Mill’s references to Bacon all antedate the edition. 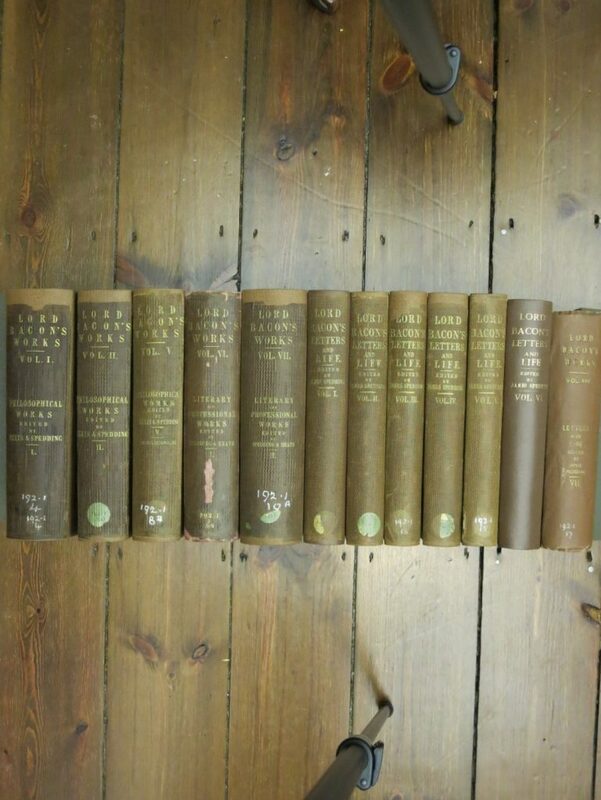 However, for all publications after 1857, the year that the first volume of the Bacon appeared, Mill may in fact be quoting from his own edition and may be doing so with much greater breadth and frequency than is presently identified in the Index. It almost goes without saying, although it should be said, that Somerville was, once again, an incredibly welcoming and comfortable place in which to do research. If only all archives were as pleasant and productive to visit. Anna Gibson is Assistant Professor of English at Duquesne University and Principal Investigator for the Dickens Working Notes Project. Meredith Martin is Associate Professor of English at Princeton University, author of The Rise and Fall of Meter, Poetry and English National Culture, 1860-1930, Principal Investigator for the Princeton Prosody Archive, and Faculty Director of the Center for Digital Humanities at Princeton. Georgios Varouxakis is Professor of the History of Political Thought at Queen Mary, University of London, author of Liberty Abroad: J. S. Mill on International Relations, Mill on Nationality, and Victorian Political Thought on France and the French, and Co-Director of the QMUL Centre for the Study of the History of Political Thought. Phyllis Weliver is Associate Professor of English at Saint Louis University, author of The Musical Crowd in English Fiction, 1840-1910: Class, Culture and Nation and Women Musicians in Victorian Fiction, 1860-1900: Representations of Music, Science and Gender in the Leisured Home, and Principal Investigator for Sounding Tennyson. Alex Zakaras is Associate Professor of Political Science at the University of Vermont, author of Individuality and Mass Democracy: Mill, Emerson, and the Burdens of Citizenship, and co-editor of J. S. Mill’s Political Thought: A Bicentennial Retrospective. In addition to providing general advice about all things Mill- and DH-related, they will be beta-testing our database and web search interface prototypes (once we have them) and serving as a peer review board of all prospective content for our final website (including both general introductory materials and critical introductions to the marginalia found in selected books). After I filled the spreadsheets, I went back through the 1,906 photos. 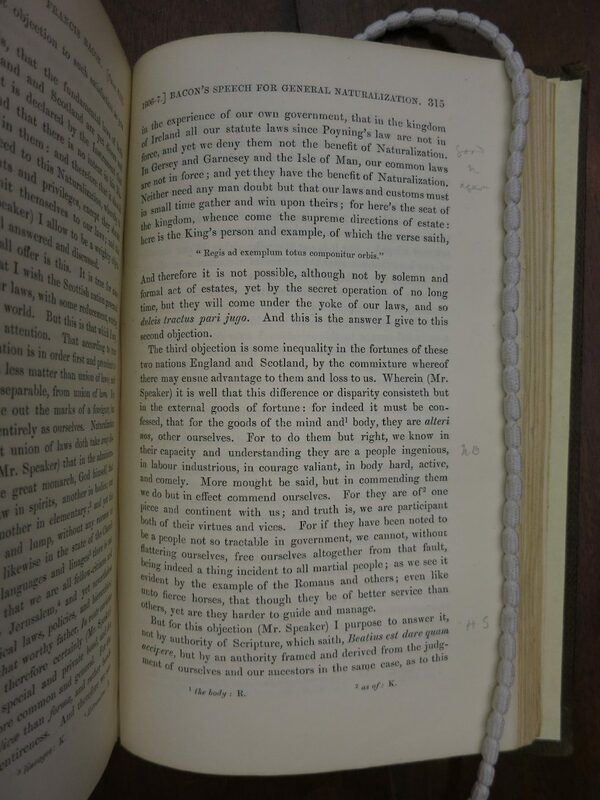 To ensure quality, Dr. Pionke had taken two photos of each marked page, and occasionally a zoomed-in picture of text blocks. This was helpful while working through the marginalia, but users of the final project wouldn’t really need the duplicates. So my next task was going through the photo sets and paring them down as well as filing them for the database. I compared each set of duplicates and chose the better photo, rotated it to the appropriate alignment, and renamed the file based on our agreed-upon naming convention (Author Title Volume.Page.OtherInfo). The zoomed-in files we kept, in case users had trouble reading text in the full-page photos. I then added two columns to the spreadsheet to include these file names—one for full-page photos and another for zoomed-in pages. That second column also came in handy for notes in which Mill referenced other pages; the referenced pages went into the same column as the zoomed-in photos. The inclusion of file names directly in the spreadsheet will make it easier for Tyler (our web design expert) to tie the photos to the information in the final website. I also added rows for unmarked title pages, which we had decided to include in the database. Moving forward, I won’t be doing much with the project. 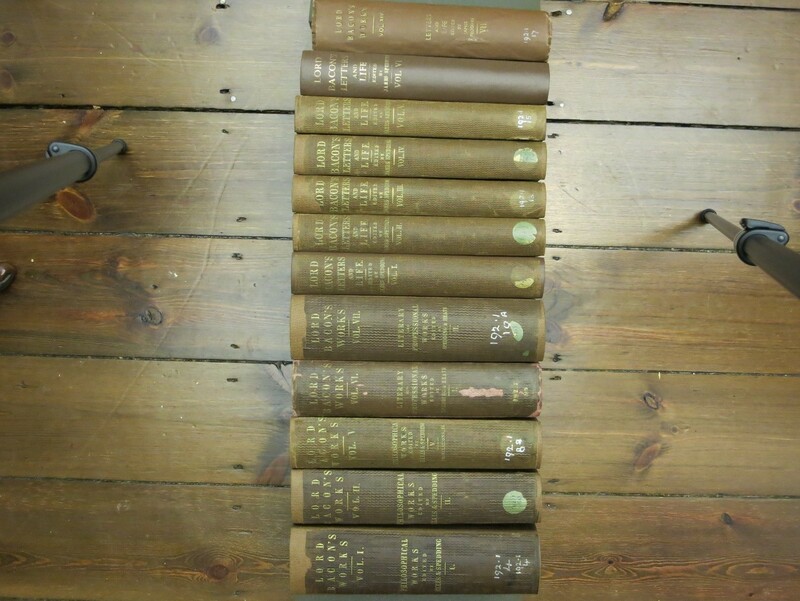 The next step for this section of the project involves choosing the best example of each type of marginalia for a potential reference section of the site, which has already begun. The process was definitely satisfying in a lot of ways. I started with 1,906 photos and ended with 7 comprehensive sheets of marginalia. I can’t wait to see the future of the project, and I’m very excited about this information being available to the public on a large scale. I’m very glad I got the opportunity to work with this team and learn more about the inner workings of J.S. Mill! – Carissa Schreiber, former Research Assistant to Professor Albert Pionke at the University of Alabama. Sometimes, transcribing these marks was fairly tedious. There were sets of pages where each had one small score, and entering the information for those over and over again was not the most fun part of the project. But there were several moments that made up for it. One thing that kept the transcriptions interesting was decrypting Mill’s handwriting. His longer comments, especially ones at the ends of chapters, were generally written very neatly. 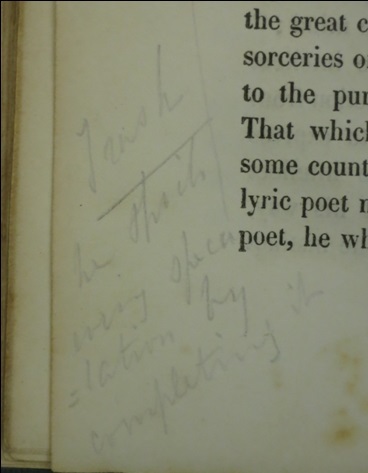 However, when he was in the midst of reading and presumably not paying too much attention to his writing, the scribbles could be difficult to decipher. The photos below provide some examples. LDP.HS.20.ot: Nonsense! It failed / perhaps / because it / did not express / itself by / supply + demand? The best part, though, was when Mill jumped in with his opinions. In his essays and reviews, Mill was very cordial and polite. In his personal notes, however, his sass and superior attitude rival Neil Degrasse Tyson’s. He was particularly passionate about two texts. 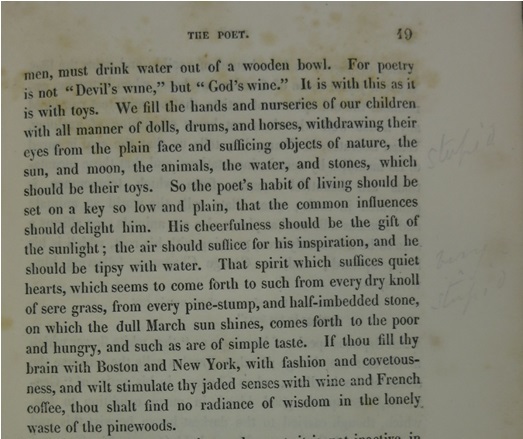 The first was Carlyle’s Latter-Day Pamphlets (Hudson’s Statue in particular), which was interesting because they had at one time been good friends. ‘Stupid’: Mill on Emerson, RWE E2.19. – Carissa Schreiber, former Research Assistant to Professor Pionke at the University of Alabama. 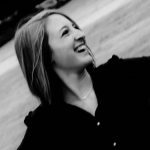 Before I get into the details, a little about me: My name is Carissa Schreiber. 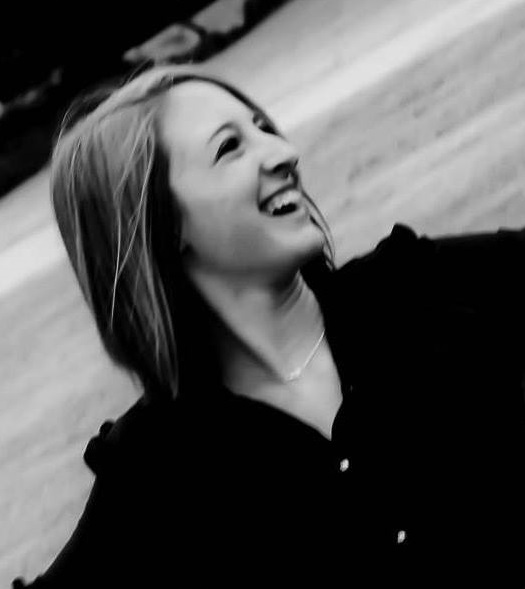 Carissa Schreiber, former Research Assistant at the University of Alabama. I love football and food. I graduated from the University of Alabama this May (2016) with an English major, and I currently live in New York. When I joined the project in August 2015, I had taken three consecutive courses with Dr. Pionke, so I was very excited about the opportunity to work with him on such an interesting research endeavor. My most significant task involved filling spreadsheets with information about each example of marginalia. The marginalia I transcribed came from Dr. Pionke’s photos, many of which had multiple marks on them. This came out to about 1400 individual examples. This seemed daunting at first (what if I missed one? what if I couldn’t read his writing? ), but over time, I was able to get into a rhythm and get more familiar with the examples present. I fell into a language of annotation, so much so that my own notes in books became suspiciously similar to Mill’s—somehow I assumed that I would remember my own meanings behind scores, dashes, and checkmarks. The jury’s still out on whether this was actually useful for me. 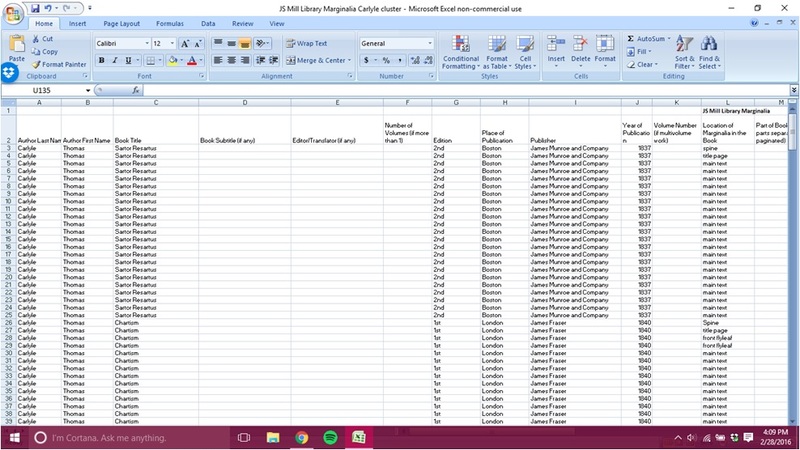 The data in the spreadsheets included basic information about the volumes, such as title, edition, publisher, etc. so that the marks can be traced back to the text they correspond to. 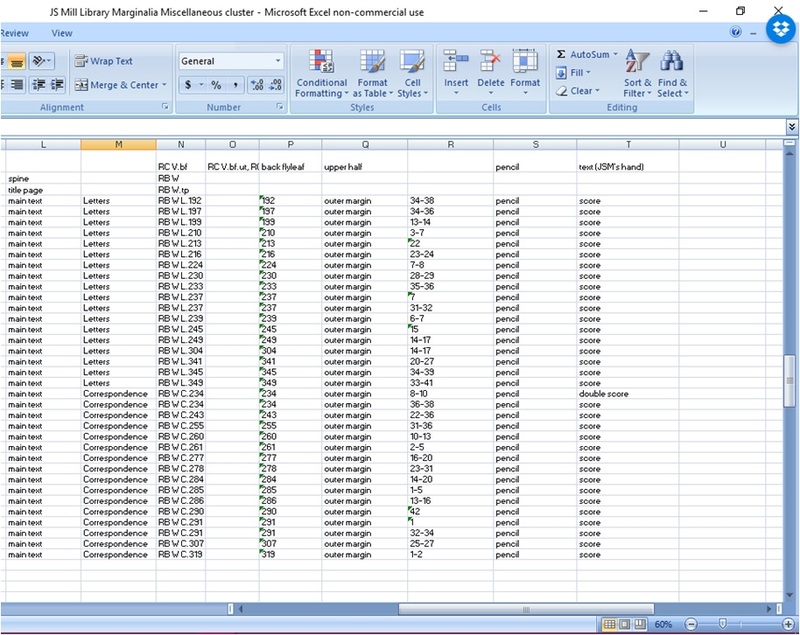 This was the easy part—for each text, I could use Excel’s “fill” feature to copy endless lines of text. The more complicated part was recording details about the writing instrument, location, and, of course, the actual transcriptions. 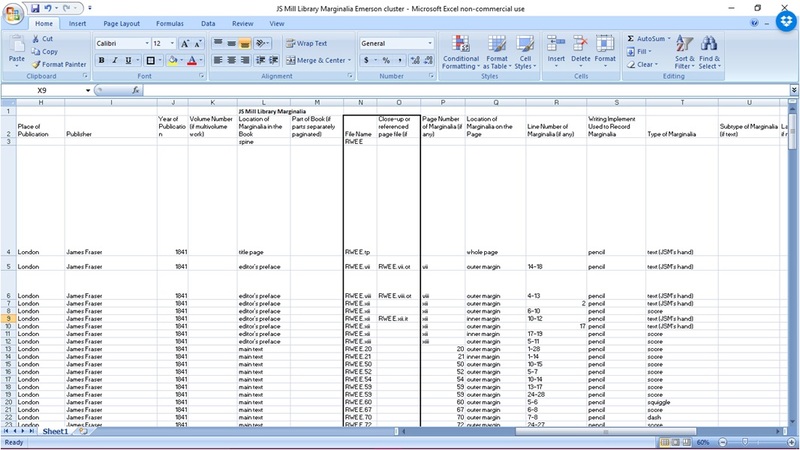 As you can imagine, this wealth of information made for an intimidatingly large spreadsheet. Mill and Carlyle by Spreadsheet. Picture courtesy of Carissa Schreiber. The marks varied from simple dashes to extensive notes about the content, and every mark meant a new line of information. There were pages with only faint marks, which took quite a while to notice and identify, and there were pages with several marks, which made me feel like I was getting a lot more done. I identified the type of writing instrument (Mill favors pencil), the type of mark, and counted lines of text so I could cite exactly where to find the mark. It was always nice to remember that my work meant the lack of work for final project users—and I’d imagine the sort of conclusions they could draw by analyzing Mill’s exclamation point and check mark usage throughout de Tocqueville volumes. The transcriptions were generally fairly simple, but sometimes included distinguishing between very similar marks, such as these varying types of scores (dotted, tailed, corrugated, double, normal). Keeping Score: Mill’s various marginal scores, picture courtesy of Albert Pionke and Carissa Schreiber. The naming of these specific marks also caused problems sometimes, going through several iterations—the corrugated score began as simply a “curved score,” then became “scalloped,” and finally “corrugated.” While I usually took the lead on these names, I always confirmed them with Dr. Pionke. The corrugated score in particular was so problematic to name that even he conferred with other members of the English department to create the perfect title. Those 1400 marks were an adventure, a journey through the inner workings of J. S. Mill’s (very sassy) mind. I can’t wait to see what people are able to draw from such information, and I’m so glad I got to be a part of it.